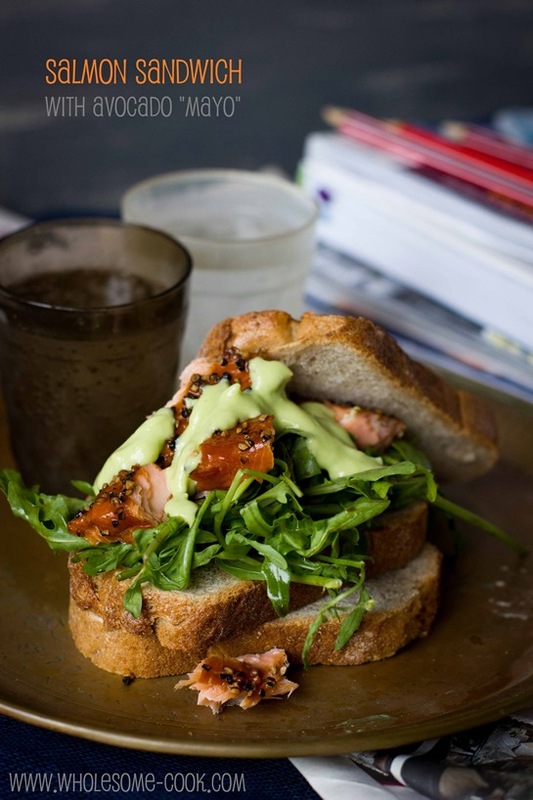 If you like sushi, you will love the fresh and spicy flavours in this Salmon Salad Sandwich. Dressed with egg-free and vegan Avocado “Mayo” it can be enjoyed on its own, without bread if you prefer. It can also be easily packed for a work lunch. (egg-free, dairy-free; option: gluten-free, Paleo, soy-free; vegan – mayo) It is interesting how our bodies have a way of telling us what they need. I’ve been reading a lot about cravings – the way these needs manifest themselves, in my Integrative Nutrition coursework. Many of the cravings can be easily deciphered and often substituted by healthier alternatives. And so, if you crave ice cream why not try having a glass of chilled fruity tea that will have the same cooling effect on the body without the additional calories and additives. On the flip side, I think we often experience the anti-craving; or not feeling particularly hungry for a certain type of food. And so for instance, I hardly ever feel like having rice and I don’t often have pasta or bread. The strange thing about bread is that while I grew up on sourdough and rye bread sandwiches and I find the smell of a freshly baked loaf irresistible, my body does not always agree. Recently I have began to notice that I cannot eat a slice of bread in the evening without feeling bloated and so I have been cutting down on my consumption of the same after lunch. This particular salad filling, whether you have it between two slices of your favourite bread or as a salad, is great for when your body is craving good fats, a few greens and a touch of salt. So, tell me, what foods do you most often crave and do you try to make healthier substitutes? Inspired by the fabulous combination of flavours found in my favourite sushi roll, served between two slices of lightly toasted rye sourdough this rocket, salmon, tamari, avocado and wasabi sandwich is fresh, a little rustic and it packs a real peppery punch. Make into a sandwich, wrap or enjoy as a salad. Spread coconut oil (or butter) on both sides of each bread slice. Place slices under a medium-hot grill or in a sandwich press and toast for 2 minutes, or until the crust starts to turn lightly golden and the fat has melted into the bread. When ready, transfer to your serving plate. In the meantime, place baby rocket in a medium bowl and drizzle with tamari (or fish sauce), mix well and set aside. In a measuring jug, combine avocado, filtered water, lemon juice, wasabi paste, salt and pepper. Using an immersion blender (stick blender), blend the ingredients until they are liquefied and similar in consistency to mayonnaise. To assemble the sandwich, top one bread slice with dressed rocket and compact down a little. 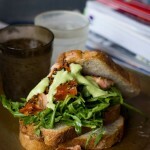 Top with shredded hot-smoked salmon then dress with the wasabi-avocado mayo and top with the remaining bread slice. Serve immediately or wrap in some baking paper and take to work as packed lunch. yummy! Thanks for the list and suggestions on satusfying cravings the healthier way too. Great tips there! Love the idea of substituting cheese for other healthy fats as dairy is not something we like to have often. And this avo mayo sounds yum, especially with wasabi – nice kick. Thanks Minxie – like you I think the wasabi makes the mayo! 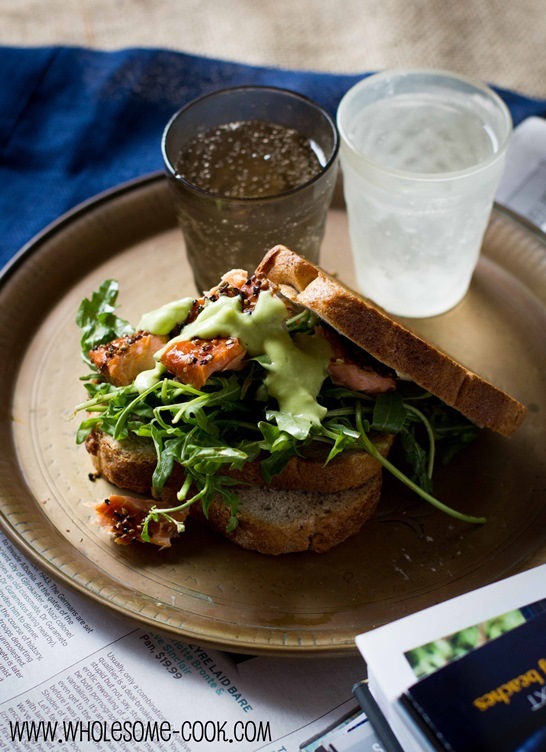 Such a beautiful looking sandwich – love your idea with the avo mayo too! Great photos! This sandwich looks incredible! What amazing flavors…that avocado mayo looks wonderful. Marty, this looks really delicious! 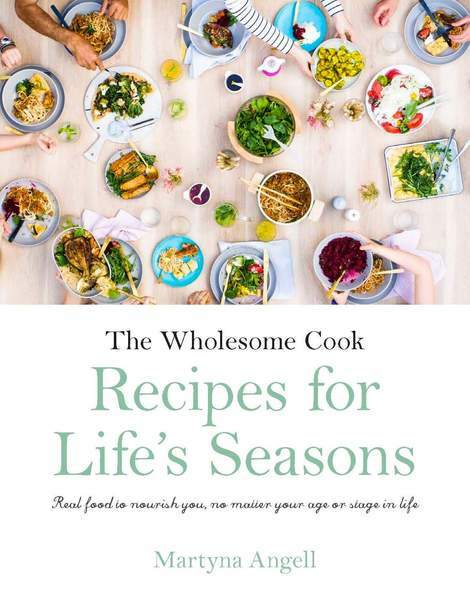 Indeed, I can see it going nicely with a sundried tomato, rocket and roasted beef salad already! This salad sandwich looks so yummy! Avocado mayo sounds very nice. What an interesting post! I had no idea about the cravings thing. Love the sandwich too. Avocado mayo!!!! I haven’t made that before, and this is a must make recipe of this week! And believe it or not, I also have some leftover salmon pieces from last night dinner. I think I am meant to make this, for sure!!!! Hi Nami, thats great to hear! I can imagine this going really well with the seared scallops you’ve made 🙂 yummy! What a gorgeous sandwich! I sure wish I was having this for lunch!